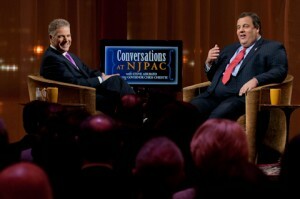 Emmy Award-winning winning broadcaster Steve Adubato talks with Governor Chris Christie on the set of “Conversations at NJPAC with Steve Adubato,” a new PBS series set to premiere in prime time on Wednesday, January 9 at 8 p.m. on NJTV (PBS), followed by an encore presentation on Thirteen/WNET (PBS) Thursday, January 17 at 10 p.m.
On December 18, 2012, Steve Adubato sat down with New Jersey Governor Chris Christie for a candid, up-close and personal interview that will be the premiere edition of “Conversations at NJPAC with Steve Adubato,” airing in prime time on Wednesday, January 9 at 8 p.m. on NJTV (PBS), followed by an encore presentation on Thirteen/WNET (PBS) Thursday, January 17 at 10 p.m.
“The ‘Conversations at NJPAC’ series was powerful and amazingly candid. The audience’s reaction to Governor Chris Christie spoke for itself. In fact, many told me later that it was like eavesdropping on a conversation between two people with no cameras and no rules, much less a television broadcast. It was Chris Christie unplugged on everything from leading the state after Hurricane Sandy to Bruce Springsteen and everything in between. I’ve interviewed the Governor on many occasions but this by far was the most interesting and compelling discussion we’ve had. I’m confident that the audience will feel the same when it hits the air in January. As for this program marking our 25 years on the air, I couldn’t think of a better way than to celebrate it at NJPAC, where we featured our most talented and engaging artists both talking and performing on camera. I’m excited about the new ‘Conversations at NJPAC’ series and I know that our audience and longtime viewers will not be disappointed!” said Steve Adubato. In Governor Chris Christie’s interview, he focused on his leadership in the wake of Hurricane Sandy, the impact of his public life on his family, as well as pressing public policy issues facing our state. 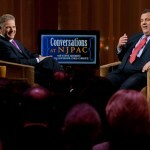 Former NJ Governor Tom Kean, Sr.
“Conversations at NJPAC,” including “A Conversation with New Jersey Governor Chris Christie at NJPAC,” will air January thru March on PBS stations Thirteen/WNET, NJTV, WHYY, as well as on FiOS1 and TCN-The Comcast Network. It will also air on the radio on NPR stations WBGO and WNYC. The Caucus Educational Corporation partnered with the New Jersey Performing Arts Center (NJPAC) to produce this one-of-a-kind week of programming, shot on-location at NJPAC in downtown Newark. “On behalf of everyone at WNET, we congratulate Steve Adubato and the Caucus Educational Corporation on 25 great years of broadcasting,” expressed Neal Shapiro, President & CEO, WNET. The Caucus Educational Corporation (CEC) is the non-profit educational television production company that produces “Caucus: New Jersey,” which has garnered 28 Emmy nominations and has won four prestigious Emmy Awards, as well as “One-on-One,” which features some of the region’s most compelling personalities, “On the Line,” a series of live call-in programs with New Jersey governors and gubernatorial candidates, “New Jersey Capitol Report,” examining our state’s most pressing public affairs issues, and “Life & Living with Joanna Gagis,” a NJ lifestyle program. For 25 years, CEC programming has reached over 10 million households in six states, including New York, Pennsylvania, Connecticut, Delaware, Maryland, and the entire state of New Jersey. Partnered with Thirteen/WNET and NJTV, the CEC produces more than 180 programs each year for its many series, which can be seen on PBS, cable television, radio and on the Internet. “For the past 25 years, I have had the unique opportunity of working with a dedicated team of producers and production experts at Caucus: New Jersey. It has been our privilege to have broadcast programs for the past 25 years on a variety of subjects from healthcare to education, the environment to taxes, from the future of our families to the future of our state and nation,” said Steve Adubato, President & Executive Producer.